As owners of a fantastic steam park, you’re to build gigantic, coal-powered rides to attract as many visitors as you can – but building attractions won’t be enough. You’ll also need to manage your employees, invest in advertising in order to attract and please the different kinds of guests visiting your park, and, above all, keep the dirt that your park produces under strict control! Steam Park is an easy-to-learn game with two difficulty levels: one for the less experienced gamers and a more strategic one for those who want a more exciting challenge. In this management game, you’ll have to build your own amusement park and make it the largest and most profitable in the region. By constructing the three-dimensional, wonderful rides designed by Marie Cardouat, you will see your park grow right before your eyes. Choose your strategy! Build Stands to attract more Visitors, or Toilets to keep the Dirt under control. Whatever decision you take, take it quickly: The less time you spend planning, the more time you’ll have to maintain your park. Thanks to a clever, original action-choosing mechanism, winning in Steam Park is as much a matter of being the best as of being the fastest! In the halls of Hell, the daemon lords settle their differences like gentlemen — which is to say, they send their minions to do battle for them, with the winner bringing honor for its master. The most powerful lords keep stables with hundreds of daemonish minions, monsters bred or just stitched together for nothing but combat. It isn’t uncommon for these monsters’ masters to invent a quarrel just to see their minions fight! Daemon Dice is a fast-paced game of individual combat between monsters of every shape and daemonish breed. Each player assembles a daemon from dice representing various body parts. These monsters are then pitted against each other in battle. A player loses if he cannot roll any dice on his turn. Originally designed by Lester Smith as Chaos Progenitus, the rules for Daemon Dice have been developed further by Chuck Pint and Cliff Wiggs of SFR, Inc. The Daemon Dice starter includes 26 18mm 6-sided custom dice, enough for two players to begin their diabolic battles: 13 assorted body parts for each of two breeds of daemon (Frost and Rot). Additional expansions will be released to add new breeds of daemons to your battles, and to add powerful new weapons to the combat. Behind the seals and wards of a secret tomb lie twelve elite warriors, encased in bonds of sacred linen and purest silver. Though their king is long dead, the warriors’ service to the powers of darkness is a constant threat. A lone Guardian keeps eternal watch, hoping to reclaim her lost honor by forbidding both the entrance of trespassers and the rising of sleeping horrors. 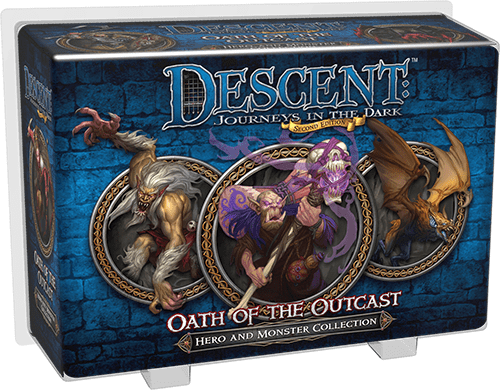 Fantasy Flight Games is proud to announce Oath of the Outcast, the first Hero and Monster Collection for Descent: Journeys in the Dark Second Edition! Oath of the Outcast offers you new options for exploring the potential of noble heroes and the overlord’s deadliest monsters through a new form of expansion. Oath of the Outcast introduces four heroes and three monster groups previously only available in the first edition of Descent: Journeys in the Dark, as well as two brand-new quests. Trenloe the Strong, Laurel of Bloodwood, Elder Mok, and Shiver join your quests as eager heroes, but even as they enter your quests, monsters arise to attack. Oath of the Outcast includes three monster groups: bane spiders, beastmen, and razorwings! Along with the 15 included miniatures, you will also gain two new quests in this expansion: Oath of the Outcast and Prison of Ice and Lies. In these quests, you will attempt to stop the perpetrators of a dark ritual from reanimating a host of powerful undead warriors. In Scotland Yard Master — a new version of the 1983 Spiel des Jahres-winning Scotland Yard — one of the players takes on the role of Mr. X. His job is to move from point to point around the map of London by taking taxis, buses or subways. The detectives – that is, the remaining players acting in concert – move around similarly in an effort to move into the same space as Mr. X and capture him. The tricky part is that while the criminal’s mode of transportation is nearly always known, his exact location is known only intermittently throughout the game. Scotland Yard Master includes six additional game elements, four of which are part of a free app for iOS and Android that offers detectives limited tools to locate Mr. X. For example, the detectives can use radio towers to get a rough sense of where Mr. X is located, with the color of the radio waves hinting at whether he’s close to each tower. The two-dimensional game board can also be converted to a 3D view, and the detectives can ask witnesses on the buildings whether they’ve recently seen Mr. X. The app also allows for pass-and-play, with Mr. X having a self-generated PIN so that the detectives can’t accidentally discover his location. Scotland Yard Master also has new action options for Mr. X: “Helicopter” and “Sabotage”. New meaning to the larger-sized ships in Eminent Domain. Additional Role cards to support a fifth player. Additional technologies, each with an alternate cost in addition to their normal Research cost. A new category of technology (“Diverse”), requiring one planet of each type to research. Optional scenarios for asymmetric starting positions and technologies for each player. Eagle and Jaguar Warrior cards are played to the battlefield to form a chain that connects your Temple Stone to your rival’s in order to capture a sacred Teotl Stone. But the animal spirits may intervene in the form of Strike and Capture cards that can turn your own warriors against you, or even eliminate them altogether. Even the ancient Aztec gods themselves will guide the battle often to your despair. Capture three Teotl Stones and you will emerge victorious. The Witches: A Discworld Game is the second of three games by Martin Wallace set in Terry Pratchett’s Discworld, the first being Discworld: Ankh-Morpork. Life can be tough for a young witch in Lancre. Fear not, however, as some of Terry Pratchett’s most famous characters will be on hand to aid your quest. Along the way you’ll meet Granny Weatherwax, Nanny Ogg and Magrat Garlick, as well as a rich supporting cast of familiar faces from the Discworld series. When things get really tough and you feel you are turning “Black Aliss”, you can always have a cup of tea with one of your fellow witches.